May 2017, tank finally back into pretty darn good shape. Slimer and purple stylo have grown just a bit. Ouch. Over a year later. After almost a year of having a big upgrade approved I finally pulled the trigger on a large tank. This will be my first and last big tank. I had been trying to decide between a 150 and a 180. 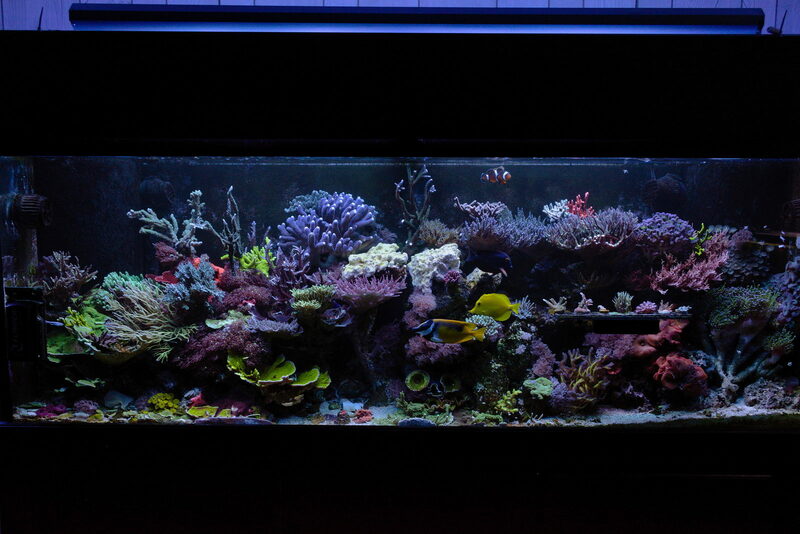 The 180 is 24 inches wide which greatly increases aquascaping options, but I've always preferred taller tanks. What finally sealed the deal was simple physics. Even with handles removed a 180 gallon tank and stand will not fit into the basement without removing the entire door. I'm not a DIY'er and the wife would have nothing to do with door removal so the choice of the 150 was set. The tank and stand will arrive Sunday evening. The two ends are NOT removable. I hate the idea of cycling a new tank, but I like the idea of doing it right and using all new rock. In the end I think I will transfer most of the 40 over, bubble algae, sand, and all. At least I don't have any (visible) aptasia thanks to the berghia I used a few months back. I love the 2 year old sand, critters, and muck that makes the 40 such a stable tank. I am still pondering the fate of the 46. The anemone will be coming over on his rock, as will all the fish except the Purple terror who will be going back to the LFS. I had this grand plan of mostly PVC plumbing but the non DIY'er in me is throwing a fit. The value of being able to close off a return rather than just filling up the sump with excess water is lost on me. I am still pondering my anti-siphon options for the return line. I have 2 circuits available and I'm considering wiring multiple GFI outlets under the stand to avoid a single point of failure if a main GFI outlet fails. In other words, non GFI into the stand, then wired similar to home electric to multiple GFI outlets for the equipment. So if the return pump shorts out, for example, it would trip the outlet the return is on but no other outlets. It would be logical to have the entire sump be on one GFI circuit so if it trips the sump goes dark, but the display pumps stay on. Heating the display during some kind of sump failure is another consideration I have to think of. Not having any of the primary circuits on GFI into the stand introduces some risk that I have to evaluate as well. I just hate the fact that I almost lost a tank because, while on vacation, a silly small drip turned the entire tank off save for a single pump I had plugged into an extension cord to a non GFI outlet. If you see any obvious issues or just want to offer an opinion over my choices please pile it on. Ok, subbing to watch this thing get built for sure! Thanks! I haven't decided yet. I have two yellow tangs that need to be added at the same time, and if I want a third I will need to add it at the same time as well. I also have to figure out if the Midas Blenny and Starry Blenny can live in the same tank without killing each other. Woops. Added to the list is the Ecotech battery backup. I'll hook one of the MP40's to it. Yea, thanks. You think the Razor will be enough for SPS at 20" depth and above? I just don't like any fixture that has red instead of warm white. I have 2 36" BuildMyLED strips (the brighter versions) to supplement one side if needed. Why wouldn't it? Intensity there will be pretty high and going up, even higher. That's what I thought, looking at the review of the smaller fixture and PAR, but I could have missed something. I own a PAR meter so I'll know soon enough. Thanks man, me either. I'll feel a little better one the beast is actually in the house. Lol my wife told me last night that once we have a bigger place with room I'll "get a big tank, right? So we have room for cool stuff?" Looking forward to seeing this evolve. Thanks. I found some nice examples of 150's online that I really liked as well. and an older picture of that setup with the stand. So apparently the sand I used in the 40 gallon is CaribSea Seaflor Special Grade Reef Sand. I did not pay attention when i forst set it up, though it may have been recommended so I chose it and then forgot why. I like it, a lot, and apparently others do as well so this will be the sand used in this tank as well. Looking forward to this one . Nice, I had a 150 back in the day. It's awesome to have so many fish options. The only thing I didn't like was the 18" depth, and the maintenance. Thanks. I can't imagine one big tank being more work than my two 40 somethings but I'll find out soon enough. Awesome! I'll be following along. A friend of mine had a midas and a starry blenny in a 90 gallon and they did fine. They'd have small spats on occasion, but they both seemed to be doing very well. I'd just add them at the same time and just make sure there is lots of rock so they can each have their own territory. Thanks for the info and for the follow. Sounds like I'm going to be adding most pairs of fish at the same time. The transfer is going to be interesting and nerve wracking. The floor is not quite level. Going to buy some hardwood tomorrow for shims. If you don't mind, I'm going to live vicariously through you. My disposable income has been diverted to the fraglet, so I'm reduced to this.